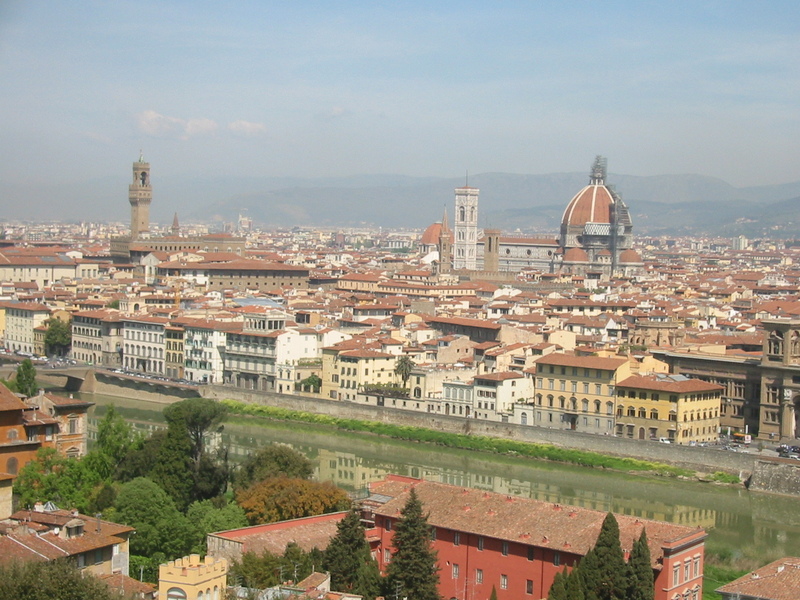 The flood of 1966 in Florence devastated millions of art masterpieces and rare books. 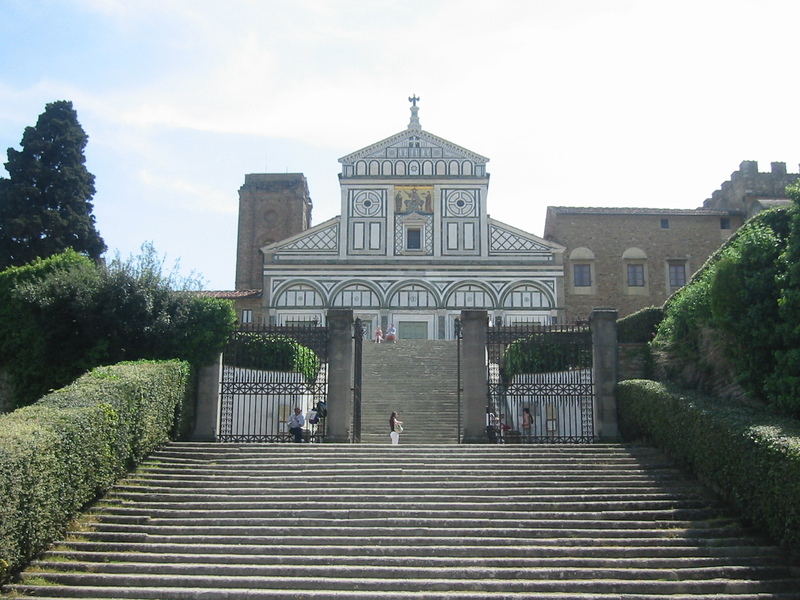 The Franciscan Basilica of Santa Croce was one of many buildings left in terrible conditions. Swirling river bottom mud settled inside the church, causing heavy damage to valuable works of art. It took a long time and a lot of effort to remove all of the debris. 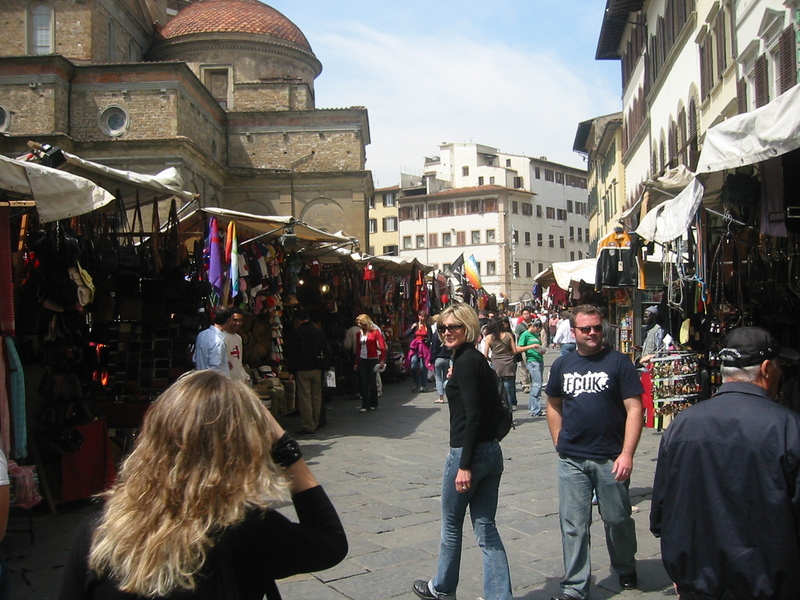 Because of its geographical location, Florence often flooded, always leaving behind a muddy mess. Volunteers from around the globe came to clean the city of refuse, mud, and oil. They removed works of art, books and other valuables from flooded rooms. Conservators worked tirelessly to restore these pieces to as close to their original condition as possible. 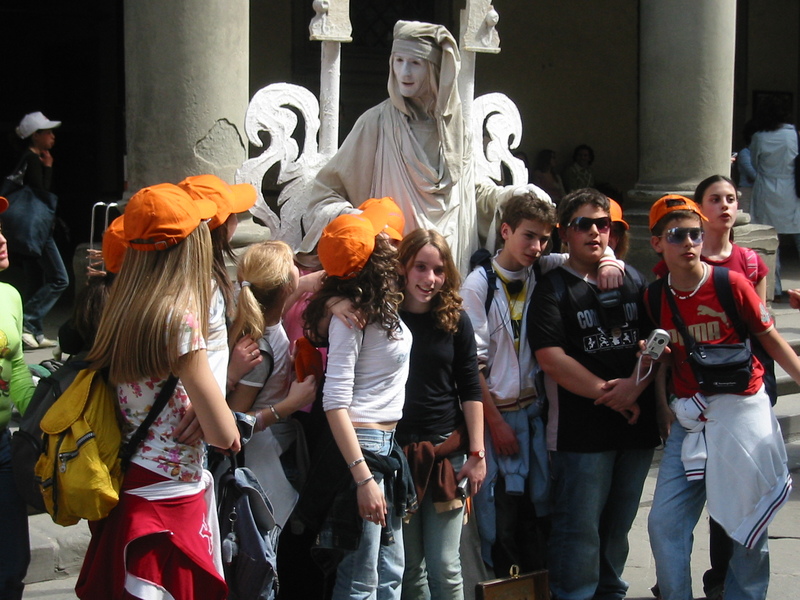 These volunteers became known as Angeli del fango–angels of the mud. 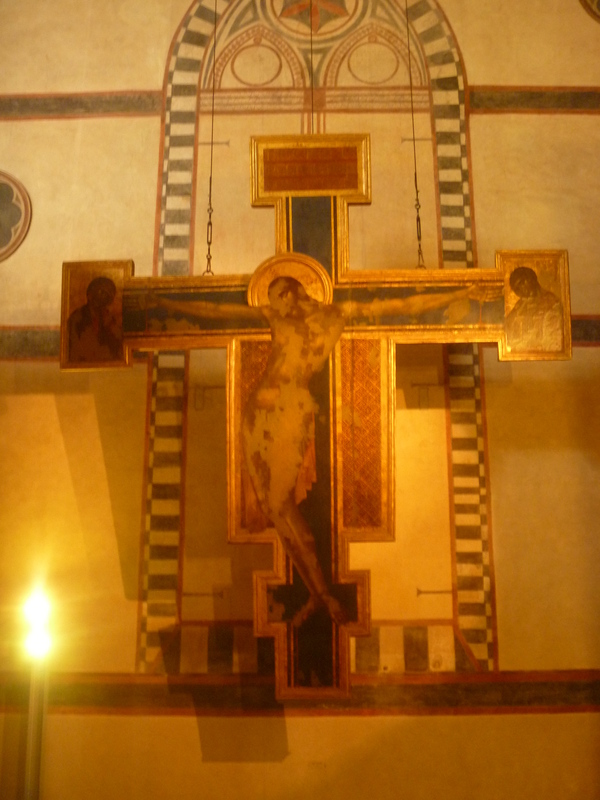 On my first visit to the Basilica of Santa Croce, I passed Cimabue’s Crucifix, painted in 1272. It was heart wrenching to see the degree of water damage that had altered the painting. 60% of its paint was missing. Housed in the refectory of the Museo dell’Opera di Santa Croce, the flood waters had risen to twenty feet, taking most of the paint off of the over 700-year-old Christ figure. The wooden crucifix absorbed so much water that it expanded by three inches and doubled its weight. It took years for the cross to shrink back down to its original size. I could see spots with sections missing. The wood had cracked, it grew mold, and paint began to flake off even after it was removed from the refectory. Later on, the cracks were filled in with prepared Poplar from the Casentino Forest, where Cimabue obtained the original Poplar. Little restoration which can be seen with the eye has been applied to the Crucifix, and it still bears the effects of water damage. As I continued my walk through the church, I felt a deep respect and appreciation for the many old works of art. They were all beautiful and rich with color, painted by famous art masters of the late medieval and early renaissance. I was touched by how an international community of caring people pitched in together to help in a time of crisis, to save a heritage that is precious to everyone. It can be said that Cimabue’s Crucifix is a part of us all. While just recently in Positano on the Amalfi Coast, I completely fell in love with the art of ceramica that I noticed displayed so decoratively all about the village. Plates and bowls painted with pastel houses, vibrant lemons, soft village scenes and active sea life reflected the warm feeling of being in a Mediterranean environment. I wanted to bring them home with me and decorate my entire house. I resolved to begin the process by finding four dinner plates that were special to me. 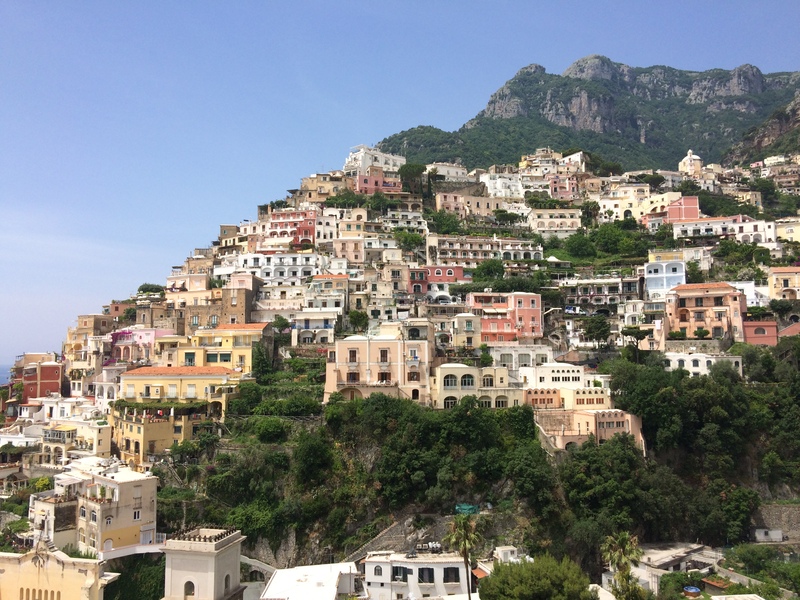 I met Lisa Cinque toward the upper part of the village of Positano. 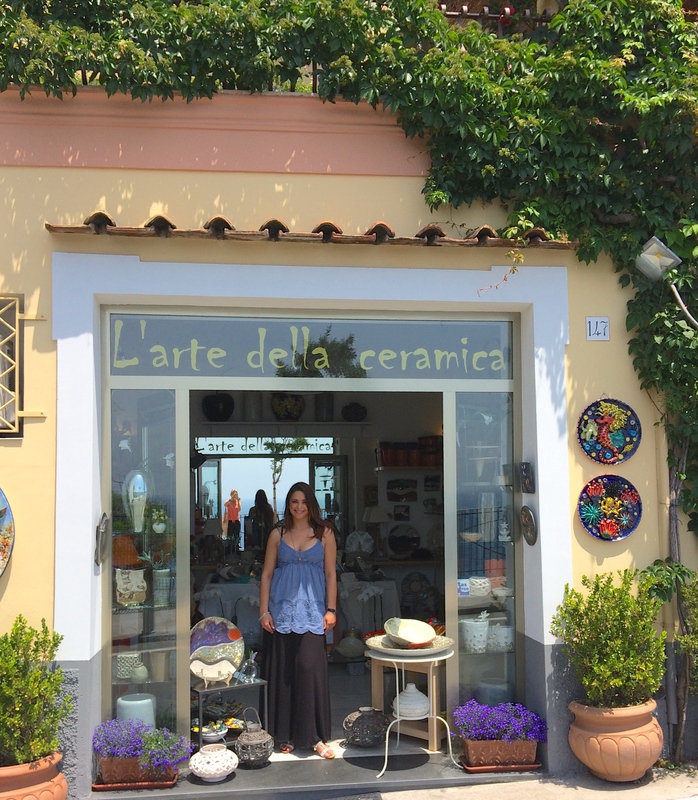 Her little shop, L’arte della Ceramica, looked out toward the sparkling blue Mediterranean. Attractive from the outside, I decided to see what she had for sale. 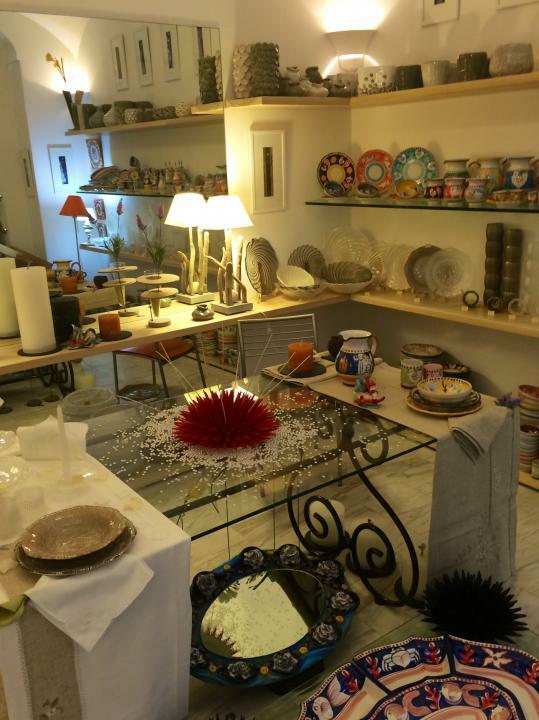 After scoping out several ceramic shops prior, Lisa’s shop stood out to me as a bit different. Her art was unique. Not only did she have the typical designs of classic Amalfi Coast ceramics, but there were original contemporary pieces with limited compositions as well. Lisa welcomed me immediately with a big smile and soft manners. 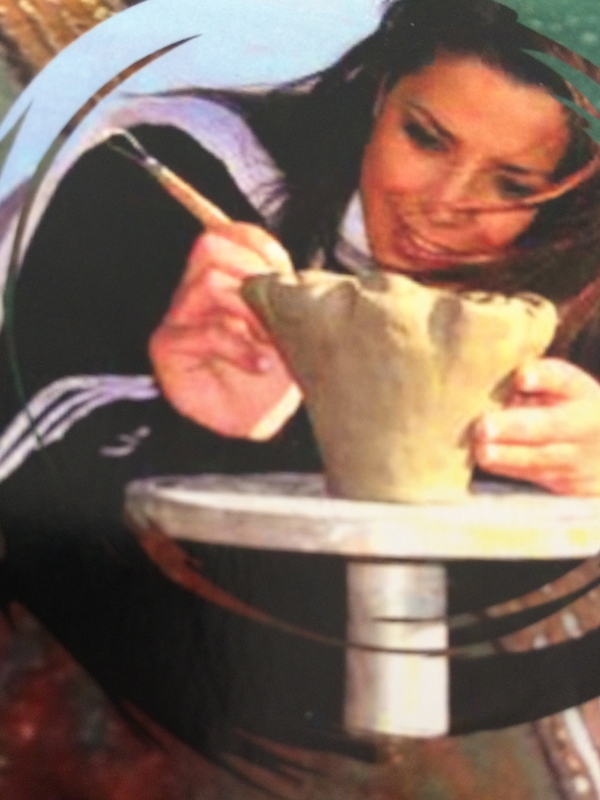 Her artwork is her pride and joy, and she spoke fondly of each piece. As she took me around, I learned that she fashions and paints each one. These were all her creations. Her deep love for art was evident in the different styles and variety of colors. She uses materials that are unusual and different, such as engobe (white or colored slip), glass and mother of pearl. 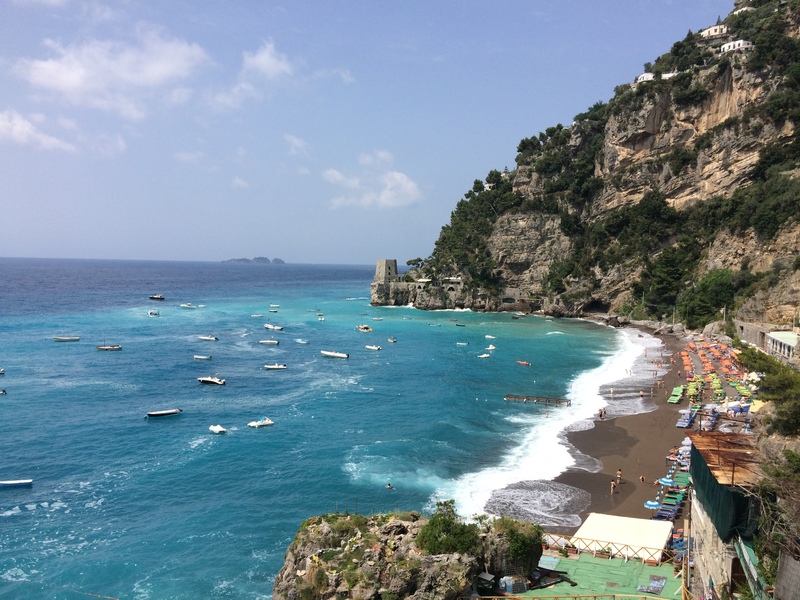 Positano is the perfect place to find inspiration. There is beauty from every angle. 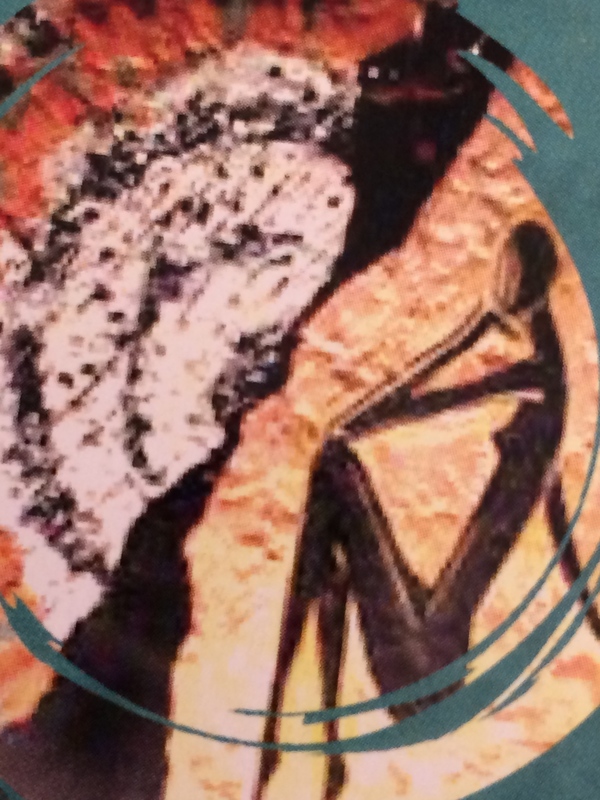 An artist in her own right, Lisa is a seeker of mood and emotion from the past as well as the present and future. Not one to follow the crowd, she has created and fashioned her own world of artistic designs that fascinate. Each one is original and unique. 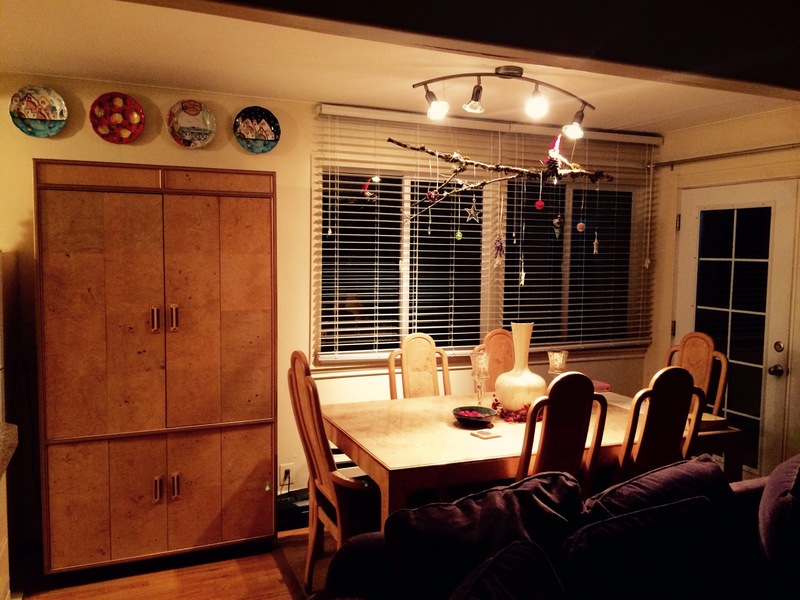 I did find my four plates in Lisa’s shop and I now have them hanging on my dining room wall. 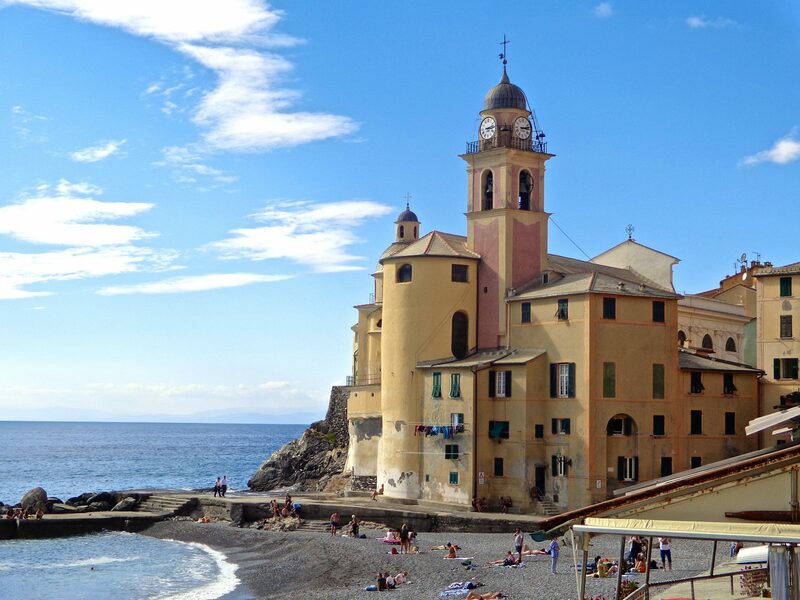 They are a joy to me and each time I stand back to look at them, i’m reminded of Lisa and her beautiful shop, of the Amalfi Coast and enduring Mediterranean environment. It’s my own little bit of paradise. My plates are the subject of conversation with dinner guests. 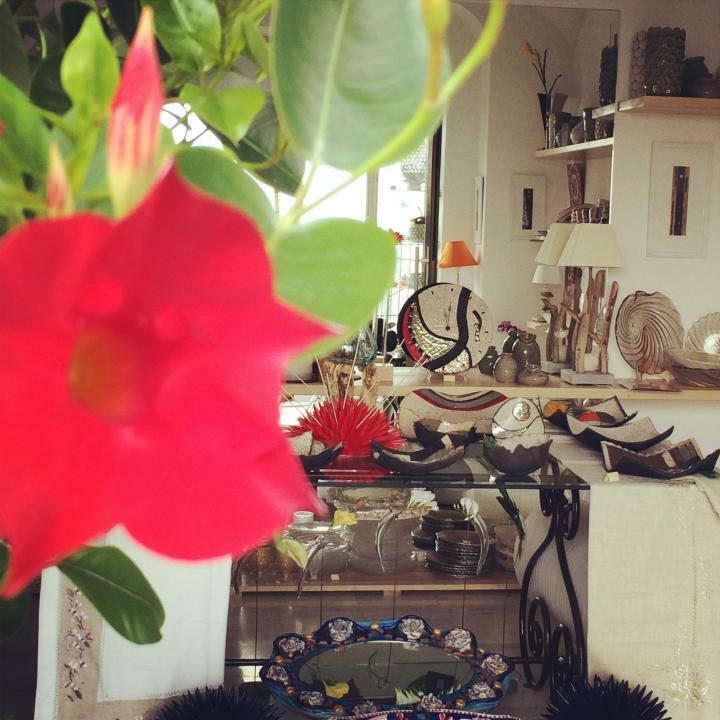 Please do visit Lisa in her shop if you find yourself in Positano. 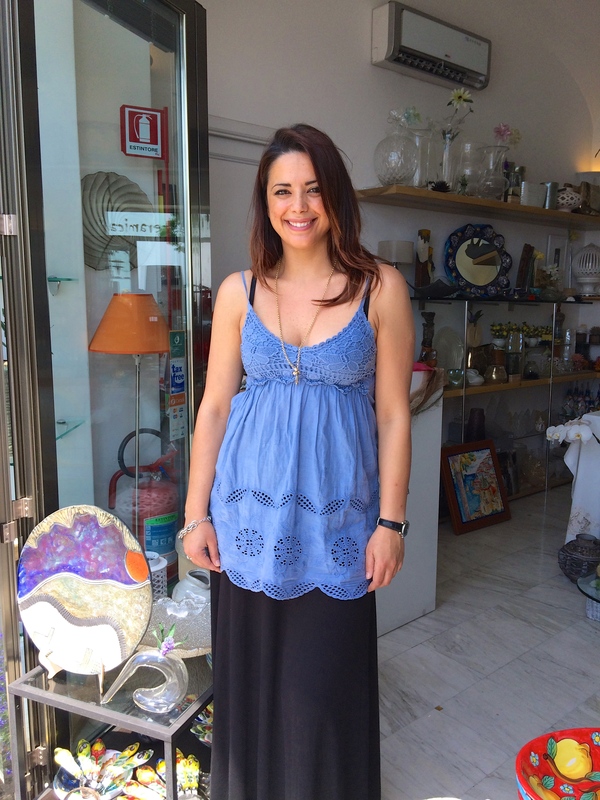 You can find her at L’arte della Ceramica, 147 Cristoforo Colombo, which is the main street in Positano, just 100 meters from the main square. 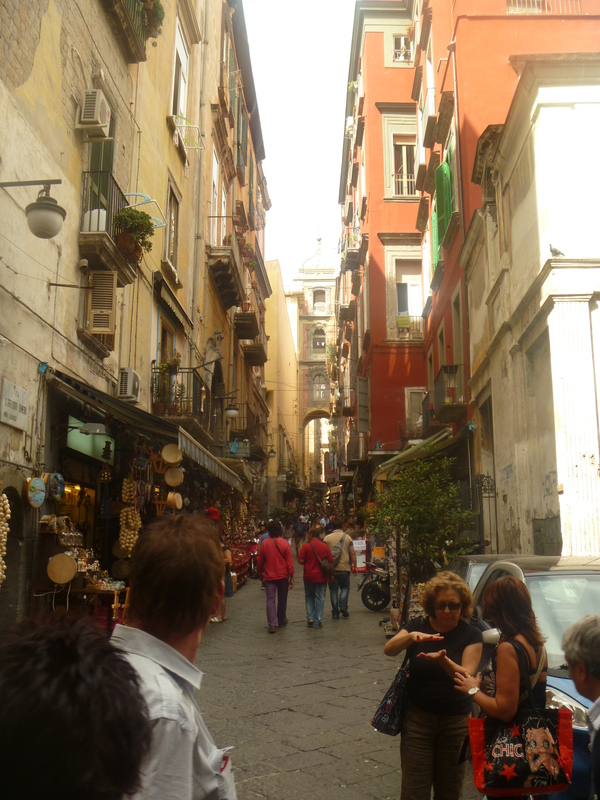 Pizza and Naples are synonymous! We had just spent the day exploring the National Archeological Museum of Naples. A big task. 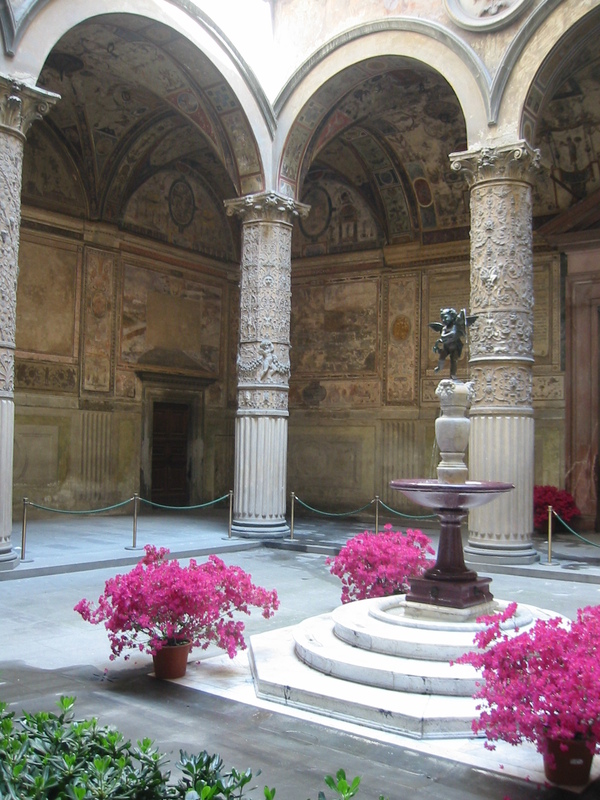 I loved taking in all the fragments of art and history, from ancient Pompeii to the early Romans. Although it consumed a lot of energy, it left me in a state of bliss. 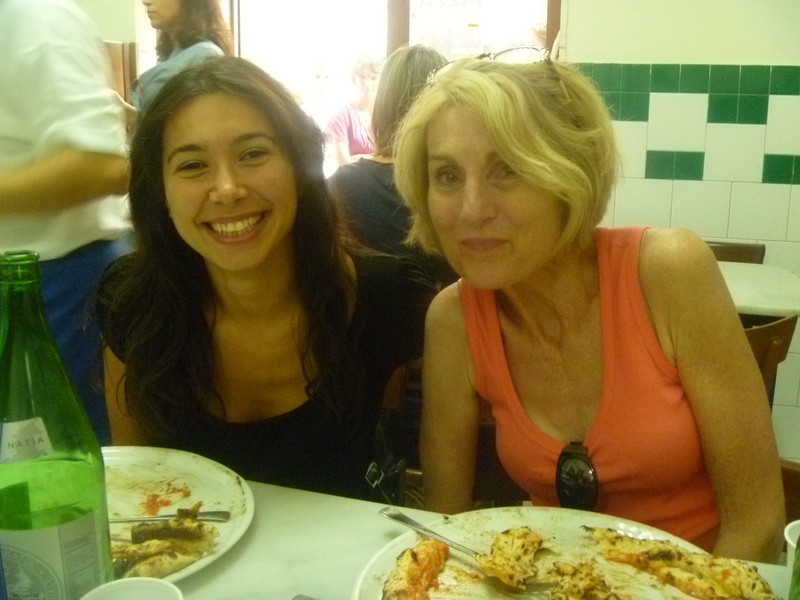 Afterwards, winding our way down the Via Tribunali, a major byway through Naples, we found ourselves overcome by a colossal hunger for pizza. 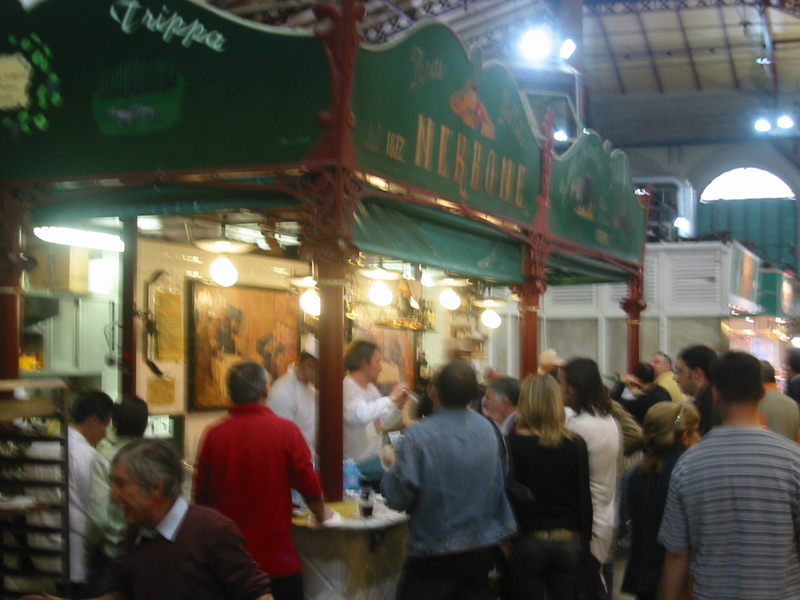 And of course, we all know that Naples turns out the very best. 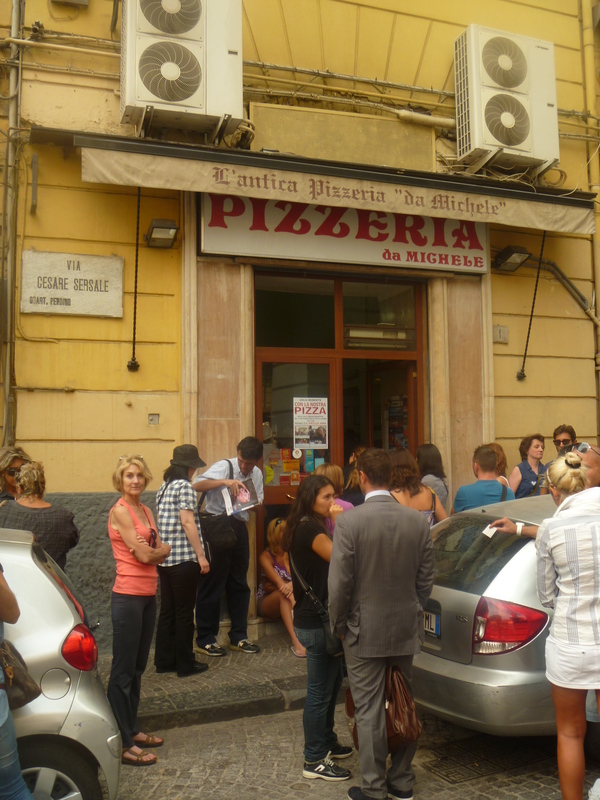 Pizzeria hole in the wall with people waiting…good sign! 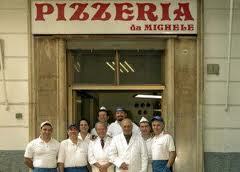 We passed several before we found this one, L’Antica Pizzeria da Michele. 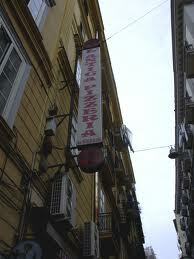 Founded in 1870, this pizzeria has been established here since 1930. There are only two true Neapolitan pizzas~ Marinara and Margherita. So many can’t be that wrong! However, as I worked my way through the crowd, I found that I needed to take a number and wait. I didn’t hesitate, especially after spying Julia Roberts on a poster from her movie “Eat, Pray, Love” on the front door. 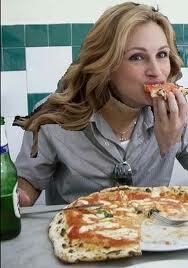 Her pizza scene was filmed right here in this tiny little unobtrusive pizzeria. Julia Roberts and this many people certainly can’t be wrong. I took up my posts outside and waited patiently for 30 minutes (yes, I timed it. I was starving!). Lunching with locals is always the best! They know where to find great bargain food. Inside were six tables built to seat four people each. We enjoyed great conversation with a young couple from Naples next to us. She spoke less english and was a bit quiet, but she had a warm and engaging smile. My husband Carl had a lively conversation with this young man. 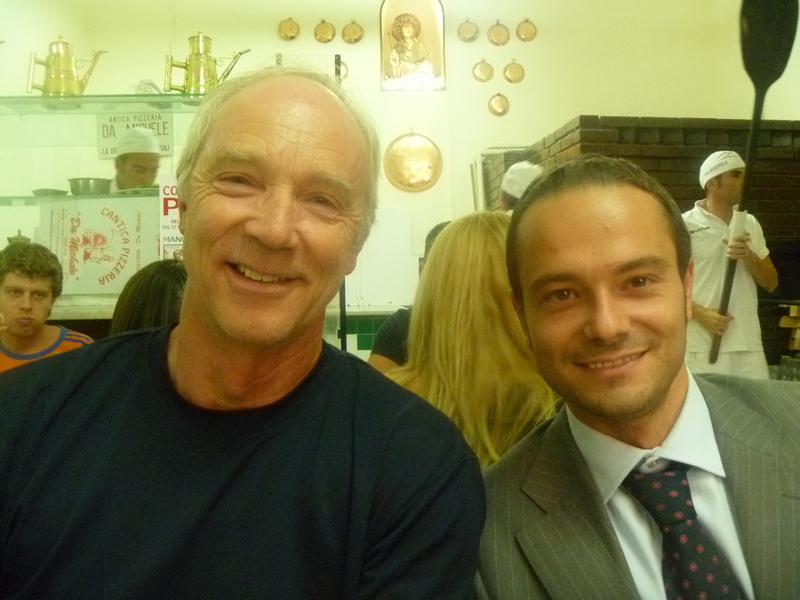 He is an attorney in Naples, and his English was excellent. We did as the locals do and ordered what they did~Margherita with extra cheese. I was not disappointed. It was the best pizza ever. Since then I have been looking for the same pizza, only to come up disillusioned. 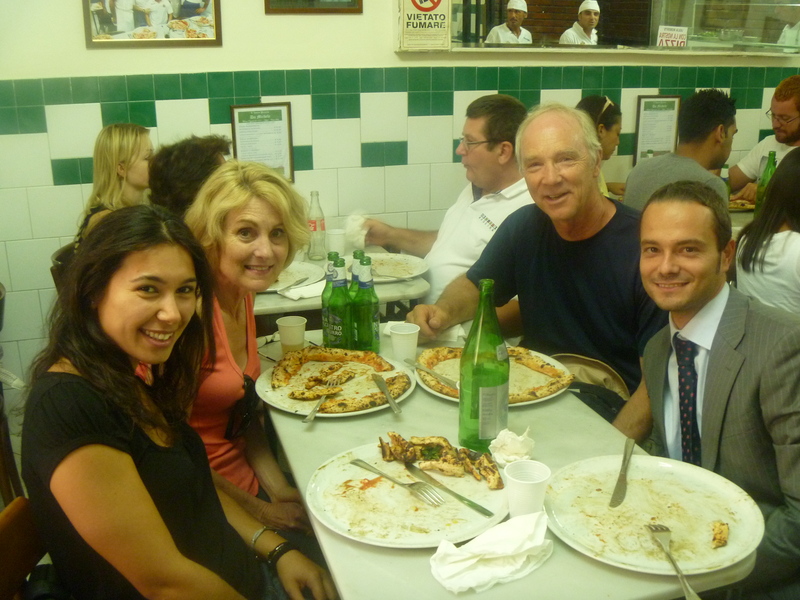 Well, no better excuse to go back to Naples and gratify my cravings at L’Antica Pizzeria da Michele!